Jesus Avila's Kid Comeback is among the other talented runners to watch in Sunday's trials. LOS ALAMITOS, CA—JANUARY 26, 2019—Thirty-four sophomores will be in action in four 350-yard trials to the $101,000 Los Alamitos Maiden Stakes on Sunday night. The horses with the 10 fastest times will advance to the Maiden Stakes final to be held on February 17. Each of the four trials will feature a field of either eight or nine sprinters to make it an attractive Late Pick Four opportunity for horse players. Horses are eligible to run in the trials if they are maidens as of December 1, 2018. Since then, eight of the trial runners have visited the winner's circle at Los Alamitos with Alejandro Fuentes' Sassy Favorite doing so in her career debut on December 14. The Favorite Cartel filly will be in action in the opening trial She won her debut by a neck in a 330-yard time of :16.94. She's one of only two horses in these trials to have already won at a distance greater than 300 yards. Ruben Lozano will pilot her from post four for trainer Valentin Zamudio. Jaime Lopez's Up For Kids is the only other 330-yard winner, doing so in her eighth career start. The Kiddy Up filly has hit the board in five other outings. She'll be facing 2019 winner Firey Hot Lips and KR Olive Oil, who broke her maiden on December 8. They're getting together in the final of four trials. Alacarrera and Commando Dynasty broke their maiden in the final week of 2018 and did it easily. They'll square off in the second trial. Cavuto and Ganster Americano exit strong wins and now face off in the third trial. 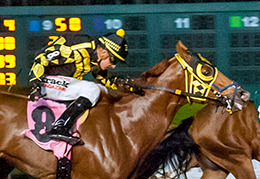 Jesus Avila's Kid Comeback, who finished third in his Los Alamitos Two Million Futurity trial is among the other talented runners to watch in Sunday's trials.